April 15 this year commemorates the 99th birth anniversary of President KIM IL SUNG. Korea declared at home and abroad that it would open the gate to a thriving nation in 2012 marking the centenary of birth of the President. “Is it possible?” asks the international community. Korea answers confidently: “Yes, possible.” It is because the building of a great prosperous and powerful nation was the lifelong desire of President KIM IL SUNG. The Koreans uphold the President like Heaven as he carved out the bright road of the country with his foresight. They also firmly believe through their life experience that his will comes true without fail. Here are some anecdotes telling of his foresight. In the 1920’s when young KIM IL SUNG embarked on the road of revolution Korea was under the colonial rule of the Japanese imperialists. With a great ambition for the independence of Korea he attended Hwasong Uisuk School set up by Korean independence campaigners in China. One day he told headmaster Choe Tong O that he wanted to leave Hwasong Uisuk School in mid-course and go to Jilin to attend a secondary school. At this Choe said: “Once you, a man, have resolved to do something, you must see it through. It is unreasonable for you to leave the school in mid-course. You say you are leaving because you do not like the education here. Where is there in this uncertain world a school that can be to everybody’s liking? ” That was a serious dialogue between Choe and young KIM IL SUNG . Choe expressed his regret at the resolve of his student, saying “If this school is not to the liking of such talented students as you, Song Ju, I too will leave it.” While attending the Hwasong Uisuk School, young KIM IL SUNG had cherished the desire to achieve the liberation and independence of Korea and build socialism and communism and decided to practice it at a broad theatre. Though he understood the headmaster, young KIM IL SUNG did not withdraw his resolve with a firm belief that only practice would prove himself. Seeing through his mind, Choe said: “I will not oppose any ism, be it nationalism or communism, if it aims at winning the independence of Korea. Anyhow, I wish your success.” The dialogue between the teacher and his student closed without end. 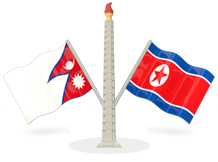 30 years after that President KIM IL SUNG and Choe Tong O met again. At that time the ideal of the President in the 1920s was coming true in Korea after defeating the US and Japanese imperialisms. The old teacher said to the President, calling his childhood name. “So Premier Song Ju, you were right at that time.” Like this, the serious dialogue at Hwasong Uisuk School came to an end after 30 years with the sincere praise of the old teacher. When will Korea be liberated? Craving for the country’s liberation, the Koreans used to talk about that problem whenever they met. In 1941 the Koreans heard the news that the Soviet Union and Japan made peace and the German army invaded the Soviet Union. The Koreans who lost the country and were living abroad writhed in a deeper agony. As the German army attacked with 170 divisions equipped with tanks and aircraft, Moscow might be occupied soon, they feared. If the only socialist state in the world is destroyed, Korea` s liberation would be difficult so much. One day Koreans living at Jiapigou village in Wangqing, China happened to see President KIM IL SUNG who was fighting in the Wangqing area, leading a small unit of the Korean People` s Revolutionary Army. They earnestly asked him when Korea would be liberated. The President told them about the complicated international situation, the inevitability of the ruin of fascism and the military achievements of the Korean People` s Revolutionary Army and said: “Please wait for 3 or 4 years more. Then a bright day is sure to come.” It was a scientific prediction based on the prevailing situation and the concrete analysis of the balance of forces. It was also his unshakable decision. The villagers shouted for joy and impatiently waited for the day. 3 years passed without liberation. Some people were even disappointed. In August 1945, the fourth year there came the news that the Japanese imperialists were defeated. At this all villagers said unanimously: “It is obvious that our General is a heaven-born man. If not so, how could he foresaw today’s liberation in the gloomy days. The following happened one day in early January 1951 at the thick of the Korean war ignited by the United States. Early in the morning President KIM IL SUNG was walking the central part of Pyongyang. Days before roads and buildings in the city had been destroyed terribly by the bombing of the enemies. Listening to the President who was conceiving a far-reading plan of reconstruction when the war was at its height, the officials pictured to their minds fireworks celebrating a victorious war. A few days later he called a designer to the Supreme Headquarters and assigned him a task to draw up a general plan on the reconstruction of Pyongyang. Then he examined the plan and completed it. After that a design exhibition was opened at the Moranbong Underground Theater for the reconstruction of Pyongyang and provincial seats. In May 1952 the cabinet of the DPRK adopted a decision “On measures for preparations for city reconstruction” and in June 1953 the military commission issued an order for the promotion of construction of brickyard. Nursery tree production bases for the afforestation of the capital city were also prepared at that time. According to the perfect plan Korea could create a new history of reconstruction from the very day of victory over the US imperialists. Like this, the wisdom and foresight of the President carved out a bright future of Korea and thanks to them, the cause of the building of a great prosperous and powerful nation too is advancing victoriously today.